The Chatswood Transport Railway and bus interchange was designed by architects Cox Richardson / DesignInc, and includes a retail complex of some 80 shops, a residential development of 509 units in 3 iconic towers, and has an estimated value on completion in excess of $360 million. Chatswood is currently the ninth busiest station on the Sydney City Rail network and is used by some 35,000 rail commuters daily. The project design includes over 2000 sqm’s of magnificent glass canopies that stretch over the development. Varying in size from 32m2 to 500m2 and ranging in height from 15m to 20m above the ground. The glass canopies are constantly exposed to the weather and break dust from the train system below. Application – EnduroShield For Glass was professionally applied to all of the glass canopies. The EnduroShield™ coating will protect the glass surfaces against the deteriorating effect of both the weather and brake dust, whilst making cleaning simpler and less frequent. 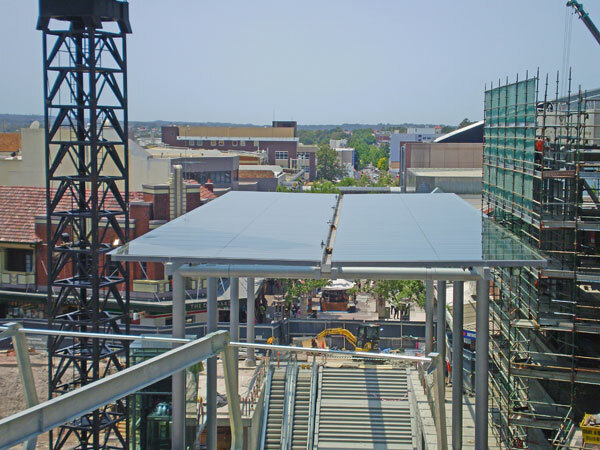 EnduroShield permanent protective coating has been applied to all of the overhead glass awnings on the NSW State Government’s current Chatswood Transport Interchange Project at Chatswood railway station. Specified by award-winning architects and urban designers, Cox Richardson/Design Inc, the coating was professionally applied by PCT Global. The glazed roof structures will extend the retail capacity whilst providing a visible and attractive linkage to either side of the station. The awnings will provide natural light and protection to the commuter concourses and newly created retail space whilst assisting in enhancing existing connections to buildings surrounding the interchange. With extensive glass awnings totalling over 2000sqm, EnduroShield™ for Glass was specified on the $360 million project because of its permanence and easy-clean properties. Varying in size from 32sqm to 500sqm the glass awnings are constantly exposed to weathering, pollution and break dust from the train system below. The coating will protect the glazed surfaces by sealing the porosity of the glass, protecting against staining, etching and the general deterioration caused by weather and pollution. EnduroShield™ is ideal for glass awnings particularly those which are cumbersome and expensive to maintain. The coating will reduce maintenance costs by minimising time spent cleaning as well as extending the period between cleans. Overall, the appearance of the interchange will benefit, with the feature glass awnings remaining cleaner for longer.